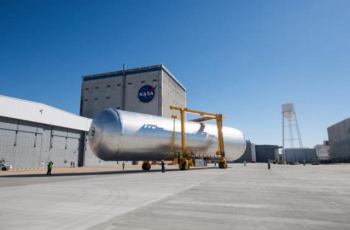 The first fully-welded Space Launch System (SLS) Core Stage propellant tank was recently moved to its proof testing facility at the Michoud Assembly Facility (MAF), to begin final preparations for the first set of tests to begin. 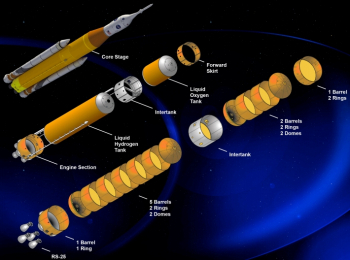 The liquid hydrogen (LH2) qualification tank will be a pathfinder for Core Stage prime contractor Boeing and NASA to begin validating the newly-assembled Core Stage hardware, along with the facilities, testing procedures, and analytical models that will help qualify the design and development of the stage for its first flight. The LH2 qualification tank was rolled from the Final Assembly area of Building 103 to Building 451, a test facility at MAF away from the main assembly area, on December 10. The first of its kind article then began preparations to do the first proof tests of the program. “This is a development program and you know the first out of the chute so there’s a lot of learning going on along the way and a lot of trying to make sure that we absolutely understand every aspect,” Steven Ernst, Boeing’s SLS Cryogenic Tanks and Welded Structures Manager, said in a recent interview with NASASpaceflight.com. Both propellant tanks have structural rings welded to the semi-circular domes at either end. The rings incorporate a flange that will eventually be used to mate to the other elements of the Core Stage; for the proof test, these will be used to bolt the hydrogen tank into the test bed. “We attach to the forward flange of the LH2 tank and we attach to the aft flange of the LH2 tank and then we impart some pretty significant loads, both axially and moments on the tank itself through some extremely large hydraulic actuators,” Ernst explained. 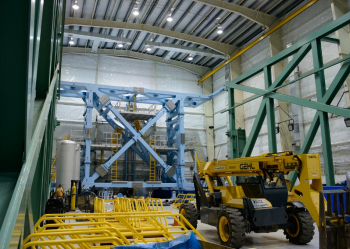 The hydraulic test rig is attached to the aft flange; the forward flange attaches to a feature of the facility called the “beer can,” which is in part a simulator for the cylindrical intertank section of the Core Stage. 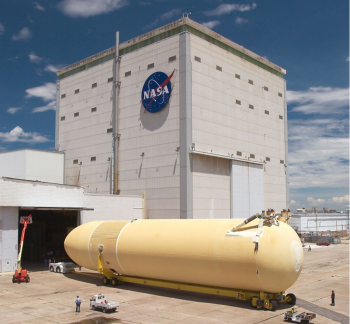 At a high-level, proof testing of the propellant tanks is done similarly to the heritage Space Shuttle External Tank (ET) that was assembled at MAF for over 30 years. 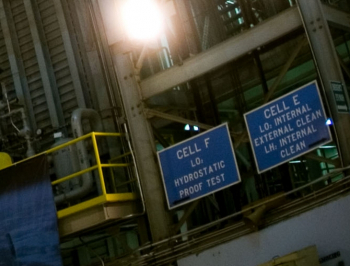 LH2 tanks are proof tested pneumatically by filling them with nitrogen gas in Building 451, a test facility at MAF separated from the main assembly area; LOX tanks are proof tested hydrostatically in Cell F in Building 110. Although the test facilities are in the same locations as the Shuttle ET, modifications were required to accommodate the significantly longer SLS tanks. In particular, with the LH2 tank of Core Stage being almost as long as the whole Shuttle ET by itself, not did Building 451 need to be stretched in length, but much of the inside was overhauled. “The beer can was something we were able to utilize from the ET program, but we had to do a significant amount of modifications to the other end of the test set up,” Ernst explained. 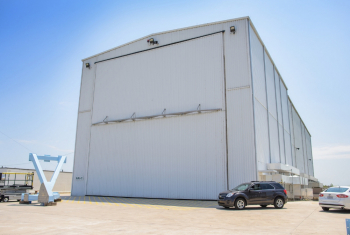 “We really had to retrofit Building 451 because as you know [for] the External Tank [there were] applied loads during the pneumatic proof test for the hydrogen tank. “On the SLS side we have the same situation, but obviously while we have solid rocket boosters (SRBs) on the side we don’t have an orbiter attached [to the side of the tank], so the load cases are different [and] the loads are somewhat higher. In contrast to the Shuttle ET, where the orbiter was mounted to the side of the tank and the thrust from its three main engines were significantly off-axis, four of those same engines (now called RS-25s) apply their thrust more symmetrically through the bottom of the SLS Core Stage. The thrust loads from the SLS Boosters are carried like the Shuttle SRBs were, through a thrust beam in the intertank that attaches to the top of the boosters at their forward skirts. As with Shuttle, the SLS intertank sits between the two propellant tanks with the LOX tank forward and the LH2 tank aft. The LH2 qualification tank is the first article to be tested in the newly renovated facility, and it will play a pathfinding role while it is there. “We’re going to use this [initial opportunity] to check out the test bed [and] test out the tank,” Ernst said. He noted that a formal test readiness review will be conducted shortly before Boeing begins running a set of test cases on the qualification tank: “Generally you do that a week to two weeks out and we’ll have an exhaustive review of every aspect of it that will not only include the technical community but program leadership both with our Boeing team as well as with our NASA team,” Ernst said. Since this is the first time most of the hardware and procedures will be exercised, the test team will go more slowly at first. “We’ll run some if you will ‘mini tests’ to make sure we understand how the system works,” Ernst said. The large volume of gaseous nitrogen – an asphyxiant – and the energy involved in the high pressures and loads applied to the tank means that for safety reasons the tests will be run from a separate building. “You’ve got the blast concern if something were to fail and of course you wouldn’t want the release of that much nitrogen in an extremely short amount of time, so the team running and monitoring the test are tucked safely away in a building nearby 451,” Ernst explained. Proof testing the SLS LOX tanks will be more similar to how it was done with the Shuttle ET. “We’re actually reusing the same hydrostatic test cell that ET used,” Ernst said. The LOX tanks will be tested in Cell F of Building 110, just across the way from the Vertical Assembly Center where they will be welded together. Although there are more similarities than with the hydrogen tanks, the SLS LOX tank still required changes to the test cell. 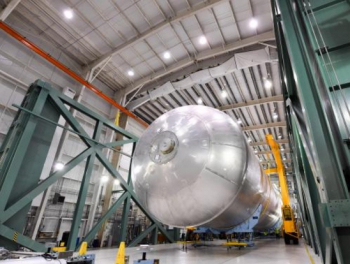 “There had to be a number of modifications to the cell because the LOX tank on SLS is a good bit larger than the LOX tank was on External Tank,” Ernst explained. Ernst said that the LOX tanks will be mounted vertically in the test cell. “The bottom end of it, if you will, is really essentially identical to how the External Tank LOX tank was tested because our tank diameters are the same,” he explained. Ernst also outlined hydrostatic test itself: “The LOX tank is filled with demineralized water and there’s a head pressure put on that. In contrast to the LH2 tank, the LOX tanks only need to be tested once. “We’ll do a fill and a drain initially that’s just to check everything out, but for the test itself [we’ll do] just one [test],” Ernst said. 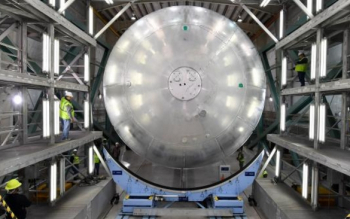 All propellant tanks will be proof tested after welding is completed; after the proof test cases are done, the tanks will be re-inspected and the state of the welds will be compared. “What we will do is called post-proof NDE (non-destructive evaluation),” Jackie Nesselroad, Boeing’s Director of Production Operations at MAF, explained. After the proof test is over, Nesselroad said that in addition to inspections, more instrumentation will be added to the qualification tank for structural testing that will be done at Marshall Space Flight Center in Alabama. (Images via NASA and L2 SLS and ET Historical).